Chris Suspect: This is the fourth year I have served as a curator on the the World-Street.Photography book competition and this year was the best of all in terms of quality images that were submitted. While I had a really tough time selecting my top images that you see below, I do want to encourage those who weren't selected to keep submitting as different curators look for different things and tastes are always evolving. I think WSP6 might be the best publication yet! Chris Suspect: Like a lightening bolt to the head, the placement and shape of this piece of plastic couldn't be more spot on. While it is a very graphic image (reminiscent of the infamous Bad Brains debut album cover where a lightening bolt strikes the US Capitol Building), there is more at play here than meets the eye with a deeper glance. For me this image reads as statement about our environment and the global sense of anxiety humans are facing with our impact on the planet. We all know lightening can strike down a tree, will our dumping of plastic waste into the world's oceans strike down mankind? Chris Suspect: This is a really fun image. 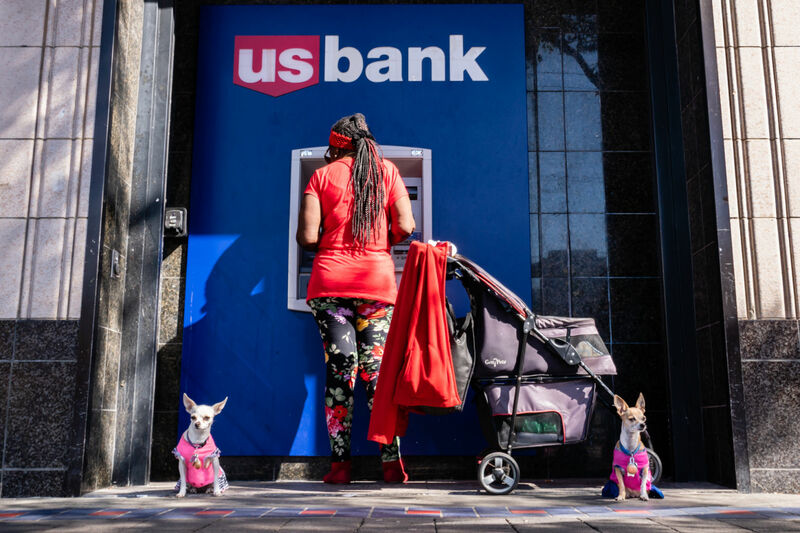 We have a woman at an ATM, presumably taking out some money, while her two adorable matching dogs stand guard. What's more is that the color palette works really well with all of the pinks, reds and blues on top of a monochrome layer of blacks and grays. There are even red and blue squares on the sidewalk just before the dogs. This is very well seen and the humor leaps off the photographic image. I'm sure Elliott Erwitt would have loved to have taken this one himself. Chris Suspect: I love quirky, odd and strange images that elude description but offer suggestive meanings. This is just one of those images that you can make up all kinds of stories too. 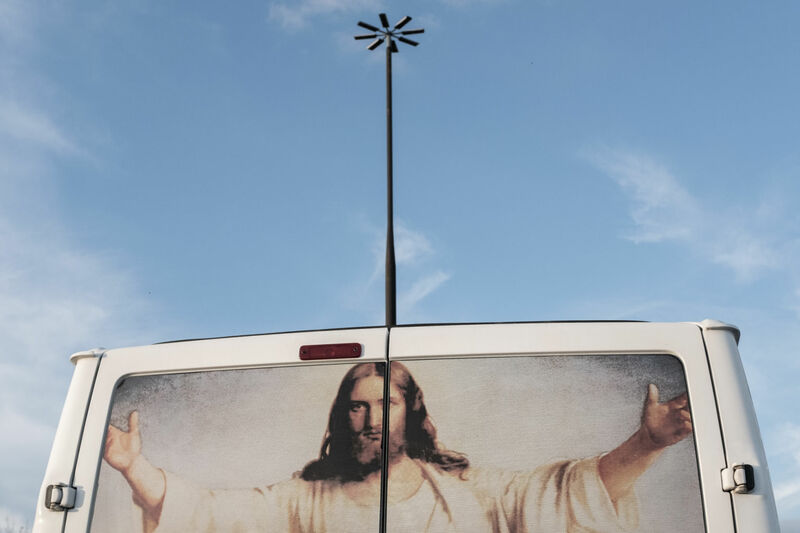 Here we have the image of Christ on the back of a van's windows perfectly aligned with what I am assuming is a light post from a parking lot in the distance. The way Jesus' arms are splayed makes it look like he is rising from the dead with the support of rotor blades sprouting out of his head. While I am not a fan of titling images, I wouldn't object if the author decided to call this "Helicopter Christ." Chris Suspect: This is a beautiful image that evokes feelings of want and longing. 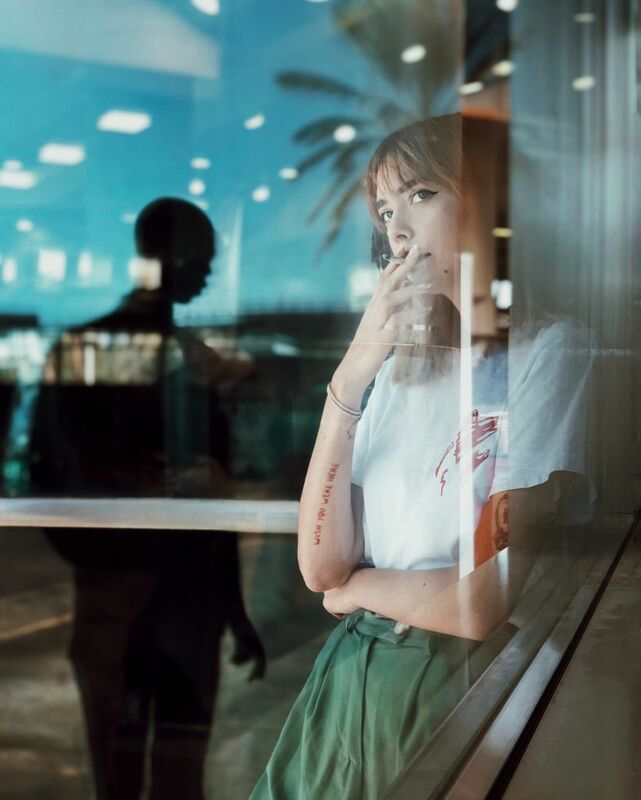 It is not a typical street image as it looks very cinematic or even like it was ripped out of fashion editorial project for a magazine. While the look of the woman in the foreground is great, it is really the silhouette of the person (or perhaps mannequin) in the background that creates the story here. Is she thinking about a memory of someone special to her? This idea is completely supported by the text scrawled on her arm that reads "wish you were here" along with the hearts on her shirt. Everything comes together nicely in this image. Chris Suspect: This well captured image clearly creates an association between the woman on the man's shoulders and the mannequins in the shop window. Of course all kinds of inferences can be made here, but I'll leave those up to your imagination. 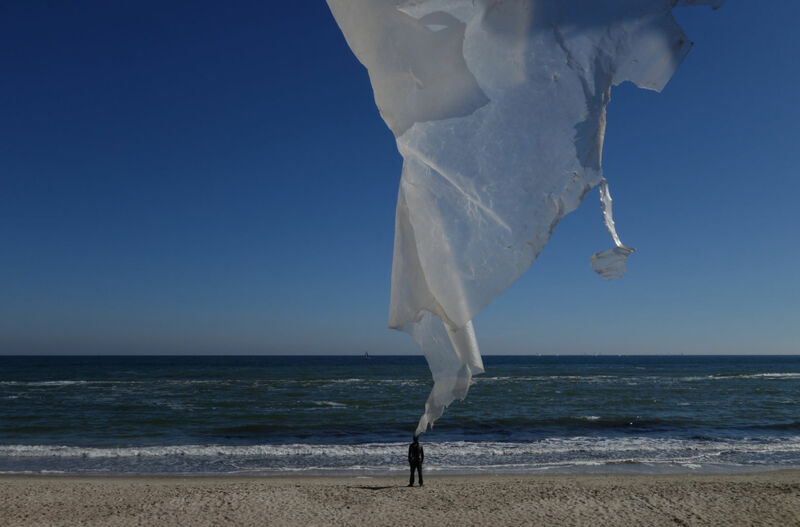 Chris Suspect: I often find it curious that in today's society where people are becoming more and more concerned about privacy in public spaces that once they hit the beach they seem to throw all of this apprehension out the window. I wonder if it's because when they go to the beach they know they are putting themselves out for show just by the nature of having to wear a swimsuit. 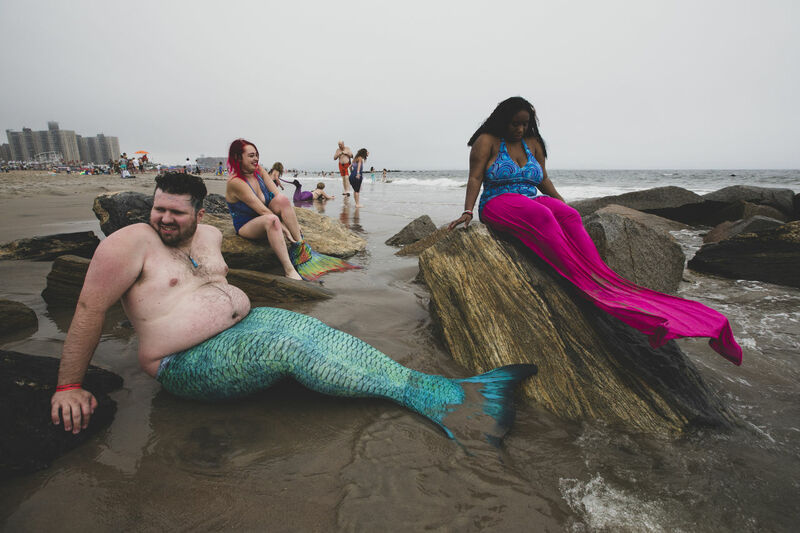 This is clearly illustrated in this wonderful, humorous photograph of real life mermen and mermaids on the beach. Chris Suspect: This is a really complex image to discern. 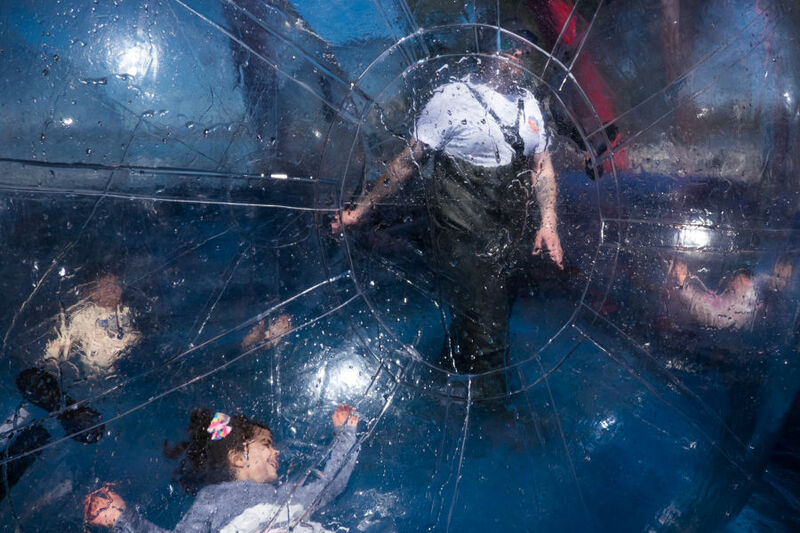 It appears we have several children inside several of those massive inflatable balls that one often sees at amusement parks. The standing person just right off center appears to be a worker in charge of ensuring the safety of these children. If we look closer we can see the "worker" possibly has her hands on two of the inflatable units but I am not entirely sure. I really like how the "worker" is framed by the seems of the ball in the foreground, almost like an iconographic image of Christ where a circular shape of a cross often appears behind Jesus' head. The water you see on the surface of the balls and the blue ground makes it appear as if the "worker" is walking on water surrounded by floating children. A strange image filled with possibilities of connotation. The son of a diplomat, Chris Suspect was born in the Philippines in 1968. He is a street and documentary photographer hailing from the Washington, D.C. area. 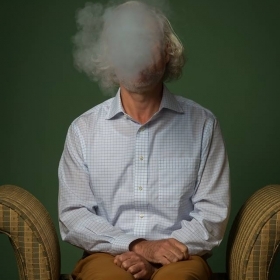 He specializes in capturing absurd and profound moments in the quotidian. 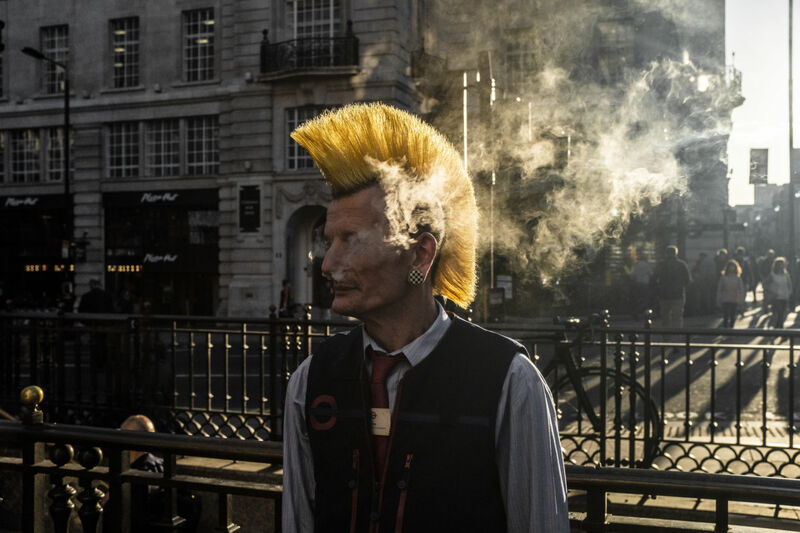 His street photography work has been recognized internationally and has been exhibited in Miami, Germany, Georgia and the United Kingdom. His documentary work on the underground music scene in Washington, D.C., was published as a book, Suspect Device, by Empty Stretch in 2014 and was a featured exhibit in the Leica Galerie at Photokina 2014 in Koln, Germany. In 2015, this same series was exhibited at the Tblisi History Museum in Georgia during the Kolga Tblisi Photo Festival. The work is currently held in the Leica Galerie Archives. Since 2012 he has been a member of the STRATA photo collective, focussing on street photography and located in Washington, D.C. and Los Angeles. In this past year, Suspect was named a finalist in the Urban Picnic Street Photography Awards (UK), a finalist in the Miami Street Photography Festival and was shortlisted for the International Street Photography Awards (UK). Locally, he was named the winner of the Washington City Paper’s 2014 Photography Contest. Previously served as a judge for the Miami Street Photography festival during Miami Art Basel (2013), he won Photo District News’ “The Scene” contest for music photography (2013) and received an honorable mention in the Chicago Photographic Society’s first annual street photography contest (2013). Suspect’s work has recently been featured in the Huffington Post, Photo District News and on the Leica Camera Blog. He also has published photographs in the Washington Post, Washington City Paper, CNN, The Atlantic, Forbes and many other media outlets in the US, Germany, Canada and Brazil.